Hi guys! Officially now ten days until Christmas and we have been counting down the days ... it's really been so fun with my little people. Christmas movies with hot chocolate, driving around to see lights (great 5 o'clock distraction) and just creating memories like watching Adie dance to the Sugar Plum Fairy song over and over ... and over by the Christmas tree. Magic! I don't know about you guys but we love when we stumble on new places to shop!!! Places to get things for my two littles is my favorite and even better when they carry all of our favorites in one place!!!! The Baby Cubby is literally the best of everything baby! 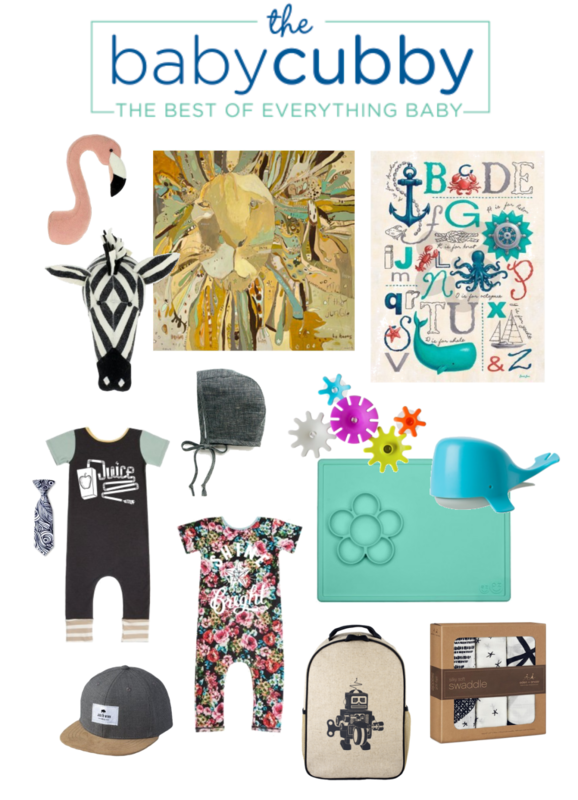 From decor, the best styles for them to wear and baby gear! Eric and I always talk about having another baby and if ... IF we do I know where I will find all our gear! The strollers, highchairs (I currently dread ours and keep it in the garage) and one of our favorite swings ever!!! I've rounded up just a few of my favorites from their site that I am in LOVE with! First things first, decor, because I love creating spaces we love to live in! We have been in our home now for a year and I feel like we still have SO much work to do!!! The kids rooms are little by little getting there. Aden's room is black and white with splashes of color so that zebra head is to die for! The lion print, even better ... I can already envision it in his room! Adie is all about everything pink and she had a flamingo birthday party last year (you can see more here) so the flamingo, well that's a must! I just love the alphabet print as well and since its aquatic, I need it! It would go perfect with a project we are currently working on!!! I just love it you guys!! Check out more of their decor for your little people's room here. I love my two babes in rompers! Easiest outfit to pick out ever and those hats ... I am literally dying right now! We have a couple Jack & Winn hats and they are the coolest hats. Aden even says hat now and tries to put it on which I am glad he wants to wear it. I grabbed the surf's up tie for Aden's stocking and I am all about that it's a clip on right now for our Dennis the Menace! Bath time is always wild at our house trying to get both bathed and everything cleaned. I love Baby Cubby's bath toys, they're are so fun. That little whale ... a must! Probably need two since both of my kids will want it at the exact same time and it doesn't need to get any wilder for bath time! Aden is the biggest blanket baby ever. Adie didn't go through this stage, she just took her monkey everywhere with her! But he drags them all over, inside and out! So we have tons of Aden and Anais blankets to keep our little guy happy. Taking Adie to school he insists he needs four or five blankets, his teddy and a car to drop her off five minutes down the road. I cannot wait until they get the flower play mat in ... Adie is all about flowers and this is perfect for after school snacks. Art projects and her new Christmas present from her Grandma KK!!! We have to have that little robot backpack for Aden ... for park dates, road trips and just to carry all his cars around in! I also grabbed a couple books, a bracelet and the cutest colored pencil set for their stockings. I love having one darling place that carries all our favorites. You still have time to grab a few of your favorites in time to put under the tree! Happy shopping and tell us what you're loving! -XO!